The real aim of this step is to provide you with a safety net for when life puts obstacles in your way and with a fully funded emergency fund, you can continue to run your household for several months. Additionally, you will have the peace of mind and one less stress from your life. Your car needs significant repairs and with which you need it to get to work. A family emergency, such as a loved one needing medical assistance. Sorry, but a fabulous two week holiday in the Caribbean does NOT count as an emergency and should be saved for separately, which is a lot easier now that you’re out of debt. 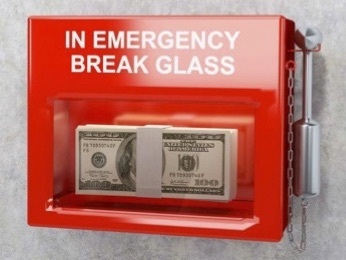 How do we build up our emergency fund? The first step is to make sure that our monthly budget is up to date (see baby step 1) with expenses of £1400 per month and multiply it by either three or £4200 or six £8400. As you’re starting out, setting your sights on at least a three months emergency fund is recommended. If after reaching your three months target you decide to continue saving, because of one of the previously mentioned emergencies, by all means, do so. If however, you’re comfortable with three months expenses, you can look forward to baby step 4 and get excited about retirement, knowing that you have the benefit of time on your side. TIP: In Baby step 1, we used a separate high-interest savings account which has the double benefit of earning interest, while removing the temptation to touch it. Okay, now that you have your fully funded emergency fund in place, it’s time to get excited about our financial futures and planning for retirement. Please leave any feedback in the comments section below.